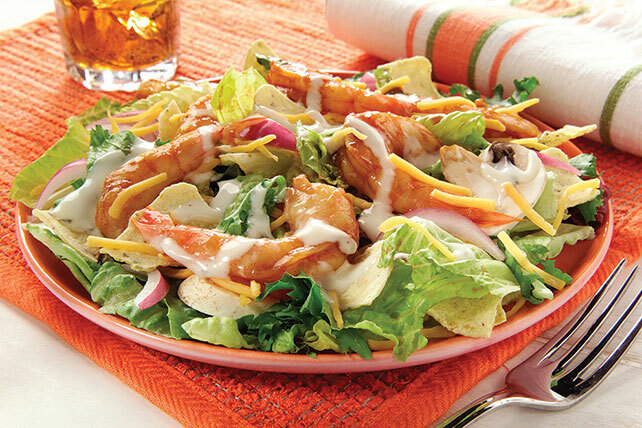 Shrimp gets a serious flavor boost when it's sautéed in BBQ sauce and served with cheddar and veggies in a big salad with ranch dressing. Heat barbecue sauce in large skillet on medium-high heat. Add shrimp; cook 5 to 7 min. or until shrimp turn pink, stirring occasionally. Toss greens with mushrooms and onions in large bowl. Add shrimp and dressing; toss to coat. Sprinkle with the cheese and chips; mix lightly. Prepare as directed, using KRAFT FREE Blue Cheese Dressing and ATHENOS Crumbled Blue Cheese.